Ways to mentally stimulate your dog. All dogs need some form of exercise, some more than others. This includes walks, running, playing ball or tug of war. Sometimes some of these very active games can over excite a dog or it's raining and it's harder to walk the dog. Dogs also need mind stimulating games as they are scavengers meaning that they can problem solve. We however put their food in a bowl, so no problem solving there...If you think about it what do they really need to problem solve? You can play games with your dogs, that not only possibly could tire your dog physically but mentally stimulate and tire your dog. Here are a few mentioned below. This game is great, you can play it any where. Start with in and around the house before trying it at parks. Hide from your dog and call him over as he starts to get it you can start making it more difficult not always hiding at the same spot. Once your dog gets the game, you can start to teach him to use his nose instead of calling him all the time, you will only call him once so that he must use other senses to find you. This is a great game to teach your dog to keep track of you and not you needing to do it the whole time as well as a great way to work on recall training. Because dogs are meant to work and find their food, instead of handing it to your dog in a bowl you can scatter it around the house for your dog to find. 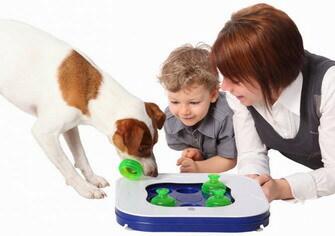 You can also use buster cubes, kongs or make your own food dispensing toy. A great favourite is to take a cooldrink bottle, drill whole in it and hang it from a tree just high enough so that your dog must stand on it's hind legs to get to it. This will both mentally and physically stimulate your dog. Granted he is physically capable to do so. Your dog will need to understand clicker training already in order to play this game. Get a box, preferably a fairly large one, and set it on the floor. Sit nearby with a clicker and treats. If your dog takes notice of the box in any way, click and give a treat. Any interaction with the box should earn a small treat. Give a big reward and lots of praise if the dog thinks of something particularly interesting to do with the box, like climbing into it or pushing it along the floor. Once the dog understands that interacting with the box earns a reward, try clicking interaction with the box, but not clicking the same two actions twice in a row. Your dog will learn that it must do something different with the box each time it wants a reward. This can lead to some really innovative behaviors. You can use the same basic steps to teach your dog to interact with various household objects. Any training game that requires the dog to make choices and learn a set of rules will be good mental exercise. You can try training scent discrimination (the dog must pick the object with your scent from a group of similar objects) or object differentiation (the dog learns the names of several objects). Contact us to join us for our nose work classes. It's tons of fun and great for your dog! You can also take a box and put some of your dogs favorite things like treats and toys in there. Close the box up and leave it for your dog to open and find goodies. This is something great to do if your dog is alone at home. Change your dogs toys at least weekly, they get tired of the same toys. Don't leave your dogs favorite toys lying around. Only take them out when you play with your dog so that it keeps him interested in it. The clicker is a great way to shape behaviors from teaching your dog to jump through a hoop,walk on different surfaces,dance to targeting objects with his mouth and feet. Be creative,there are no set rules except good timing with your click and reinforcement!Keep it fun!